Issues involving economics and politics from the perspective of a believer in free market animal agriculture. We haven’t had a chance to read it yet but USDA has sent out copies of the newest iteration of the “GIPSA Rule” as it will appear in the Federal Register tomorrow, beginning a 60-day comment period. The Rule is split into three parts, with the first dealing with the poultry industry. Part II deals with the definitions in section 202 a & b and requires 85 pages to handle. This is an Interim Rule, and will go into effect 60 days after publication. USDA will still take comments on this Interim Rule. This section deals with the requirement to show harm to competition and looks even from the titles and descriptions to be a real problem. In addition, it refers to USDA’s “longstanding interpretation” regarding harm to competition, something most of us never heard of before the 2010 Rule. If USDA had an interpretation counter to nearly all federal court decisions, it was news to most livestock folks. The third section of the Rule is to define “Unfair Practices” and “Undue Preferences” and requires 69 pages to address. This section is a Proposed Rule, with comments being taken from 60 days after publication. We will delve into the details very soon in our “AFF Sentinel” e-mail newsletter. If you do not receive the Sentinel and would like to do, send us an e-mail at steve@agfreedom.org. The Senate voted Thursday to end debate and proceed to a vote on the Trade Promotion Authority bill and several amendments. The Senate leadership expects to vote on the bill yet Friday or in a possible weekend session. The vote to end debate was 62-38 and required significant deal making by Senate Majority Leader Mitch McConnell to get the votes. He promised a vote next month on the Export-Import Bank. Boeing’s CEO also pushed Washington State’s Democrat Senators Maria Cantwell and Patty Murray to vote for TPA, with an eye towards eventually getting sales deals from a Trans-Pacific Partnership trade treaty with Asian countries. The House Agriculture Committee Wednesday approved H.R. 2393, a bill to amend the Agriculture Marketing Act of 1946, by a recorded vote of 38-6. This is the bill to repeal the mCOOL law for beef, pork and chicken products. As of this writing, there is no information on when a possible floor vote on the bill is contemplated. Thursday is the last scheduled session for the House until June 1. The Senate has not taken any action on a repeal bill. The Senate Agriculture Committee has a business meeting scheduled for Thursday morning but has not indicated an mCOOL bill will be discussed or voted upon. Senate Agriculture Committee Chairman Pat Roberts has indicated support for repealing the mCOOL law. However, Ranking Member Debbie Stabenow (D-Mi.) has issued a statement supporting the law, on the basis of consumer right-to-know theory. As former chairman of the committee, she had pledged support of mCOOL repeal and then flip-flopped over a winter weekend with no explanation for those to whom she had indicated support. Stabenow did not make any comment regarding her constituents who would have companies damaged and jobs hurt by retaliation over retaining the protectionist law. As expected by most observers, the WTO’s Appellate body again ruled Monday against the U.S. mCOOL rule. As USDA has already made it clear they have been unable to find any way to comply with both the U.S. law and WTO rules — something we said from the beginning of the COOL movement — the ruling puts a solution in Congress’ court. House Agriculture Committee Chairman K. Michael Conaway (R-TX) understands the urgency of Congress acting swiftly. He has scheduled a news conference for Tuesday and is asking for input from his committee members during a Wednesday business meeting. The Canadian Cattlemen’s Assn. has encouraged the Government of Canada to move without delay to request WTO authorization for retaliatory tariffs. That authorization could come later this summer, with tariffs totaling some $2 billion/year and affecting hundreds of U.S. products across dozens of industries. Our apologies for not posting to this blog for awhile…but it seems so many issues are so complex and lengthy, short blog posts are tough to do. Similar to the outlines of a deal we mentioned Tuesday night, the Senate has negotiated a way to get enough Democrats happy to get trade bills moving again, after Tuesday’s failed cloture vote. The Trade Promotion Authority (TPA) bill, coupled with the Trade Adjustment Assistance bill, advanced to floor debate, with a 65-33 vote. The customs enforcement bill, with currency manipulation language intact, was brought to a vote, as part of the negotiating to advance TPA. The customs bill passed 78-20. Its final fate is uncertain, given that the White House opposes it and the House Ways and Means Committee has reported out a very different bill. The TPA bill is slated to begin floor debate next week. The House is expected to take up the bill next month. Since its beginning in 2011, we’ve brought you the good news story of one of the restaurant industry’s top shelf beef burger chains — Smashburger — being a founding and lead sponsor of the American showcase for physical fitness and sports strategy — the USA Pro Cycling Challenge. For 2014, as the Challenge again takes on the steep, high-altitude roads in Colorado’s mountains and plains, another industry sponsor has arrived. American cattlemen themselves have a direct hand in the racing spectacle, as Certified Angus Beef (CAB) joins the sponsor list. CAB is proud of its role as supplier to Smashburger, one of the fastest growing and best examples of the “fast casual” restaurant category. Fast casual provides a higher quality, more individualized eating experience when a diner wants to venture above fast food fare but doesn’t have time or budget for a steakhouse meal. The race has again drawn over 120 riders and cycling teams from all over the world. From the beginning, the challenge has been for the best cyclists in the world to test themselves against the altitude of the Colorado Rockies. The racers have proven it can be done but it is not a task to be taken lightly. Riders who live and train often at high altitudes in Colorado or Colombia are less intimidated when much of the racing is above 7,000 ft. It is a test of lungs, training and stamina normal humans can only barely comprehend. In town racing is much closer at times than on the climbs. This is Aspen in 2013. This year, the race began the first day (Aug. 18) in the Aspen area, traveling to Crested Butte for Stage 2 and spending Stage 3 climbing Monarch Mountain in southern Colorado. Stage 4 will be contained in Colorado Springs. Stage 5 will begin above Colorado Springs in Woodland Park and end in Breckenridge. 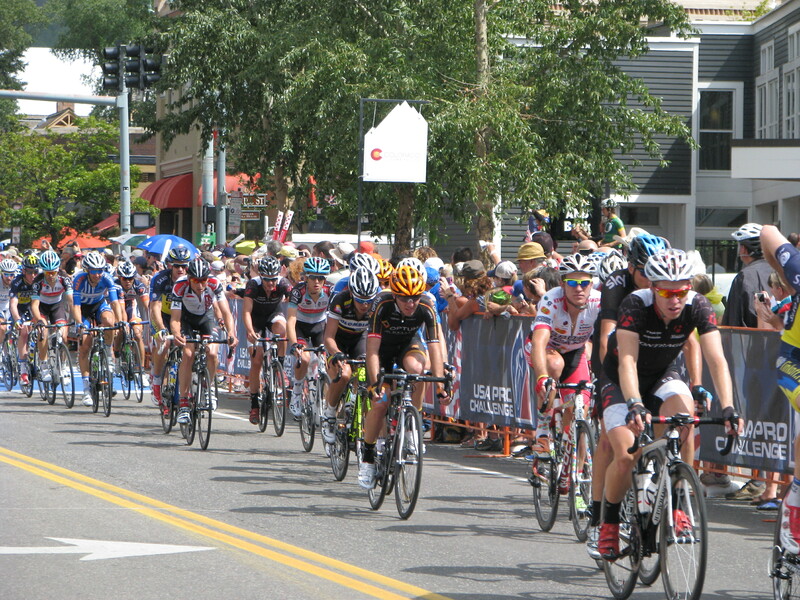 Stage 6 will be in Vail while the last stage will begin in Boulder and the big finish will be in downtown Denver. If you are in or close to Colorado this week, it is well worth seeing one of the most impressive endurance feats humans have ever devised. Of course, the Colorado scenery makes a spectacular backdrop. Television coverage is on NBC’s Sports Network (DirecTV 220) during the week and Stage 7, the finish will be on NBC’s broadcast channel. And don’t speed through the commercials. Cattlemen will enjoy seeing the Smashburger commercials, starring a great looking burger. But the broadcasts will mark a first for CAB — a television commercial playing to a national audience for the first time. The spot we saw features restaurateurs and chefs explaining why they use CAB beef. The Supreme Court has ruled that President Obama’s disputed “recess” appointments to the National Labor Relations Board were invalid. That means that all the decisions made by that illegally constituted board are null and void. That includes rules and decisions that greatly eased labor unions’ ability to call for elections and unionize employers. The board had drastically shortened the time period before elections happen and made it easier to call for elections, curtailing employers’ ability to explain their side of issues. The Court ruled that Congress was not in recess at the time President Obama claimed they were; therefore, his Constitutional power to make recess appointments could not be exercised. Experts saw the decision as one rebuke to President Obama’s tendency to assume sweeping executive power when Congress would not provide him with legislation he desired. More details will be available when the final opinion is released. EPA finally did what had been rumored it would do — lowered the mandate for renewable fuels to be blended into gasoline in 2014. On Friday, Nov. 15, 2013, EPA proposed a mandate level 16 percent less than that specified in the 2007 law. The proposal would require between 12.7 and 13.2 billion gallons of corn ethanol in 2014, a level not only lower than originally required for 2014 but lower than the mandate level for the last two years (“EPA Shrinks Ethanol Mandate for First Time,” Wall Street Journal, 11/15/13). Of course, this is not because EPA is recognizing the misguided policy aims of the Renewable Fuel Standards or the probable net loss in energy efficiency from producing fuel from corn. Nor was it a given, since reality didn’t keep the EPA from fining refiners millions of dollars a year for not using cellulosic fuel that wasn’t being produced and couldn’t be blended. Cold, hard facts do not necessarily faze bureaucrats at the EPA. But the EPA was finally made to understand that blenders can’t blend ethanol into fuel that is not being produced and sold. The continuing lousy economy under this administration and Congress, improving fuel economy on cars and trucks and the increased domestic production of oil despite the administration’s efforts to quell it have reduced the demand for gas and diesel. Meaning there was not enough fuel needed and sold to achieve the mandates on renewable fuels the law had suggested and EPA had demanded. Interestingly enough for animal agriculture, the news story in the Washington Post quoted Renewable Fuels Assn. President Bob Dineen near the beginning of their story, since it supported the manmade global warming doctrine. Perish the thought that we would allow free markets to govern what is bought and sold. After all, those “markets” that the liberals regard as so wanton and evil, are really summaries of citizens voting with their dollars for products. We can’t have that. But it was 14 paragraphs into an 18-paragraph story that animal agriculture was even heard from, and even then the Post tarred the comments from livestock and poultry producers by noting they were heard on a conference call hosted by the American Petroleum Institute, that advocate of those nasty carbon products like oil and gasoline. And the story didn’t note that livestock producers were happy to see some relief from artificially high corn prices forced by the ethanol mandate. Nor did it mention the hundreds of millions of dollars those artificial corn prices — as opposed to just higher market-determined corn prices that animal agriculture knows corn farmers needed — cost livestock producers and feeders over the last five years. But it the Post did allow in a good point and a good line, saying livestock and poultry producers didn’t see “any more need to set ethanol volume requirements than there was for setting requirements for turkey output.” Surprising they let a shaft of free market light into the discussion in a news story. Especially while the UN climate change bunch is meeting in Poland whipping up hysteria over impending doom. The U.S. District Court for the District of Columbia has denied a request for a preliminary injunction to block implementation of the new mCOOL regulations made final last spring. AMI, NCBA, North American Meat Association, Canadian Cattlemen’s Assn., Canadian and American pork councils, Mexican cattlemen, American Association of Meat Processors and Southwest Meat Association had filed the suit. AMI’s President J. Patrick Boyle has indicated an appeal will be made. The complaint had pressed the case that the requirements of the augmented new regulations exceeds the authority granted in the statute. Opponents of the new regulations have argued that the excessive costs and disruption of trade far exceeds the minimal informational benefits to consumers. Research has shown very few consumers consider origin in making meat purchases, while quality, taste, safety and cost are the main drivers. Origin does not affect safety, as health and safety standards have been in place for decades. But full implementation of these regulations would both drive costs up and likely destroy much of the meat trade between North American nations. U.S. packers already running well under capacity because of low cattle numbers, would further see operating margins deteriorate, with some border region packers possibly forced out of business by a critical shortage of cattle from both sides of the border. The extensive segregation, tracking and recordkeeping requirements and the elimination of the commingling provision would likely mean the major packers would stop buying any but U.S. livestock. Of course, that is the real reason some radical livestock and farm groups favor a strict mCOOL law. They oppose trade with other nations in meat or livestock. Megyn Kelly and Michelle Malkin highlighted the problems farmers, feeders and ranchers have been having with the EPA on Fox News’ “America Live” on Monday, June 10, 2013. We first alerted our readers to EPA’s misconduct in April in the AFF Sentinel newsletter, (“EPA Nominee No Stranger to Bad News for Agriculture-Part II,” 3/13/13, V10#09) detailing the agency’s supposedly mistaken release of detailed business and personal information on livestock feeding operations nationwide. Later, more trickled out about EPA’s behavior — which screams ideology-driven intent — that not only did the agency release the info but continued to repeat some of the information a second time when it apologized for the first breach. Then it developed EPA had been granting fee waivers to 92 percent of favored enviro-zealot groups and denying fee waivers to conservative or free market groups anywhere from 50 percent to 92 percent to 100 percent of the time. These fees were charged for Freedom of Information Act (FOIA) requests (“Arrogance,” AFF Sentinel, 05/19/13, Vol. 10#26). We’ve since learned these fees can run as much as a million dollars, so the fee waiver is no small consideration. But it was terrific to see Kelly and Malkin rake EPA over the coals, especially in light of the changed attitude in America, given the scandals erupting since EPA’s breaches over the IRS targeting, NSA information gathering on citizens and DOJ surveilling reporters without the knowledge of the news organization involved. The news peg that prompted this discussion on Fox News was a letter from 24 senators to EPA, demanding an explanation. Rightly so, Kelly and Malkin not only focused on the unauthorized release of information but on the biosecurity hazards posed by releasing this information to these groups. Malkin noted it’s not just farmers and ranchers noting this risk, but the Department of Homeland Security. We would add that not only do feeders bear a risk from the activities of some of these groups themselves — judging by their past actions — but having that information out in more hands just adds to the risk that out-and-out terrorists could get their hands on target information. Witness the fire bombing attack at Harris Ranch just last year, claimed by the Animal Liberation Front (ALF). Harris can’t hide because of its large profile but spreading information on every animal feeding operation around the country certainly exposes many more operations to risk from terrorists we know are among us. “Every day a new eruption in the culture of corruption,” Malkin termed these revelations. Not coincidentally, Malkin penned a book named “Culture of Corruption,” in 2010. Since Malkin is a bold, outspoken commentator, her book title seemed cutting edge then. Now, it seems downright prescient, given the revelations since the beginning of the scandal eruptions beginning with Benghazi.